Californians are about to start seeing truly driverless cars on their roads — that is, autonomous vehicles (AVs) without humans behind the wheel to take over if things go wrong. On Tuesday, Waymo announced it had received a permit from the California Department of Motor Vehicles (DMV) to test its AVs without a test driver behind the wheel. This makes Waymo the first company to receive such permission in the state. In February, the California DMV’s Office of Administrative Law (OAL) approved new regulations that would allow AV companies to test their vehicles without a human driver in the car to back up the autonomous system. Those new rules went into effect on April 2, but Waymo is the first company to receive a permit to conduct this next level-testing. 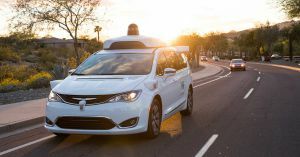 According to the Waymo announcement, this permit allows the company to test its driverless cars on California roads or highways with speed limits up to 65 miles per hour. It can conduct this testing at any time of day or night and in less-than-perfect weather conditions, such as fog or light rain. Waymo appears confident its AVs will have no trouble driving without supervision in California. Ultimately, residents of California might not even notice Waymo’s transition from testing with safety drivers in AVs to testing without them — other than perhaps finding themselves a bit spooked at the sight of a car driving itself around town.